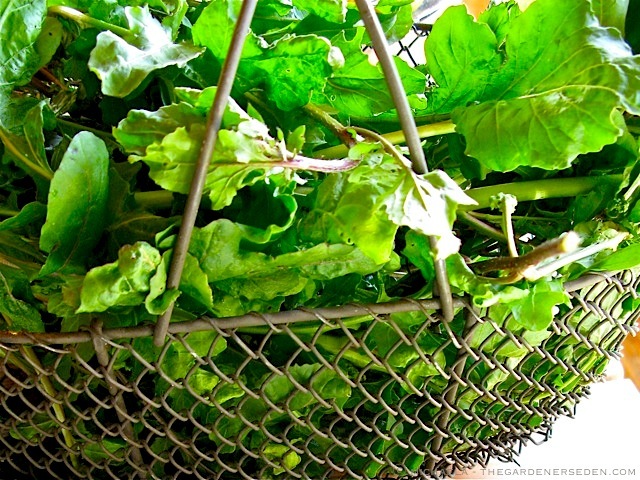 The Early Bird Catches the Arugula… And the Chard, Spinach & Lettuce too! Let’s start out with a bit of honesty, shall we? The four season harvest isn’t for wimps. 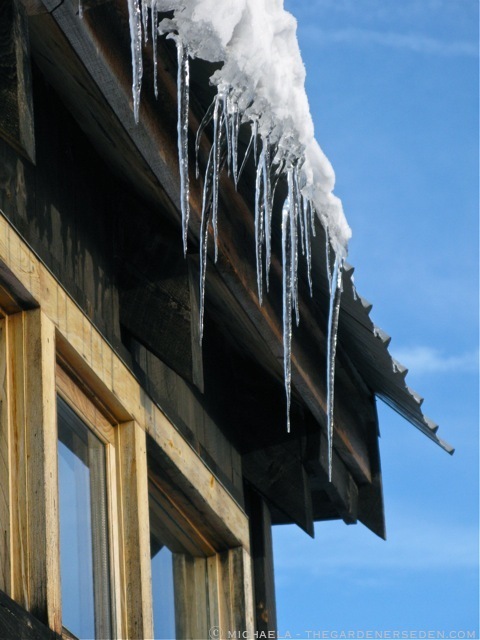 Winter gardening —growing plants in temperatures below freezing to sub-zero, beneath plastic sheeting— isn’t a natural act. And although I enjoy a good game of woman vs. wild, sometimes winter gets to be a bit much around here. 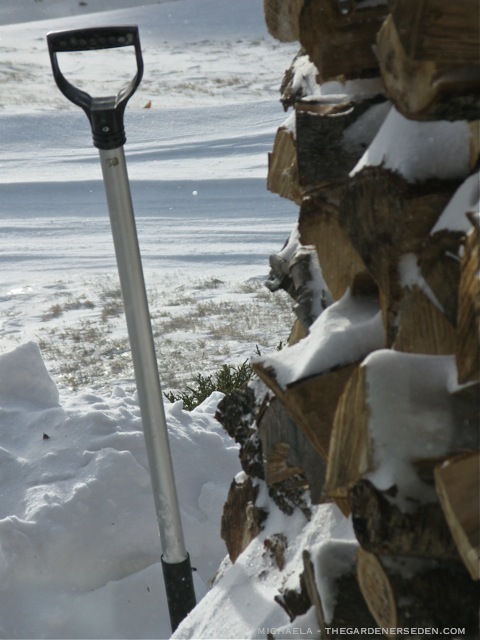 Shoveling decks, terraces, walkways and woodpiles is a lot of work. And now that I’ve added potager path-clearing and hoophouse roof-raking to the list, I’ve created quite a snow-removal burden. So why do it? Because the taste of fresh arugula and the smell of damp earth on a cold February day is —as the people at Mastercard say— priceless. And I think a jump-start to the short, northern growing season is worth a little extra work (OK, so it’s a lot of extra work). 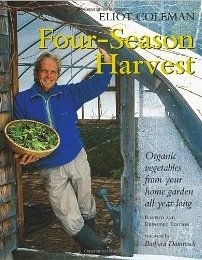 Inside this unheated hoophouse the smell of sweet, springtime soil fills the moist air! Over the past three years —cooking more at home and experimenting in my kitchen— I’ve become more and more interested in four-season vegetable gardening. And although I haven’t made the leap to a heated greenhouse yet, I’ve found that with proper timing, I can keep some crops going in my hoophouses year round. Greens sown in late fall will germinate and then continue to grow (albeit much more slowly) throughout the short, cold days of winter. Tender crops are out of the question of course, but tasty root vegetables sown in early autumn can be harvested from cold houses straight into the new year. 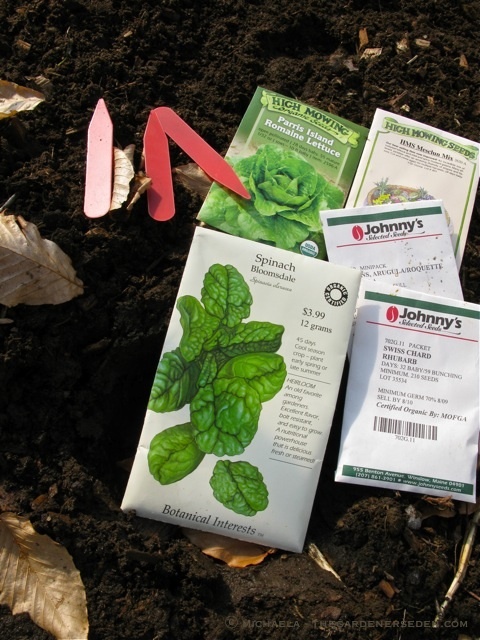 Seedlings require light to grow —10-12 hours of daylight is a good rule of thumb— so the sowing of seed is suspended during the weeks leading up to —and about a month and a half after– the winter solstice. 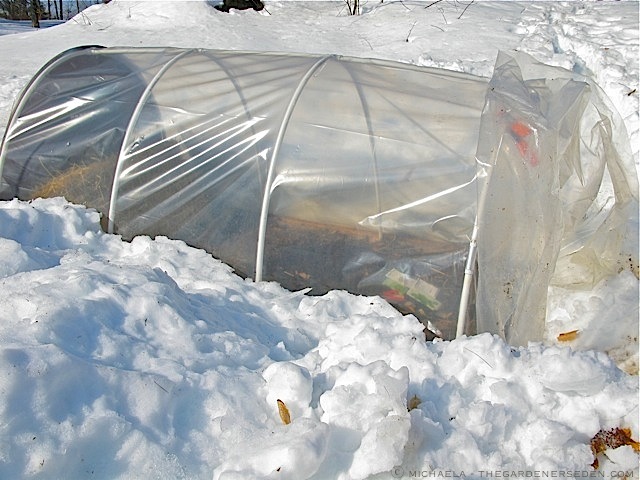 But come late January, February and March —when the days are getting longer, and sunlight is getting stronger — I can begin sowing cold-hardy, late winter crops in my unheated hoophouses, for early spring harvest. Yesterday I planted a variety of greens in house #3 (arugula, chard, spinach, lettuce and mesclun mix), and I pulled spent crops and turned soil in house #1 to prepare for more planting (carrots, radishes and other crops) on my next free afternoon. 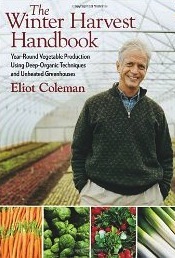 If you are interested in learning more about the four-season harvest and winter vegetable gardening, I highly recommend Eliot Coleman’s books. And if you’d like to build a hoophouse of your own this spring (I now have four, with three currently in use) click here for basic plans. I’m hoping to upgrade to a larger, walk-in cold house this year. Do you enjoy reading The Gardener’ Eden? You can help support this blog by shopping with our affiliates. A small percentage of any sale originating on this site will be paid back to The Gardener’s Eden. Thank you! 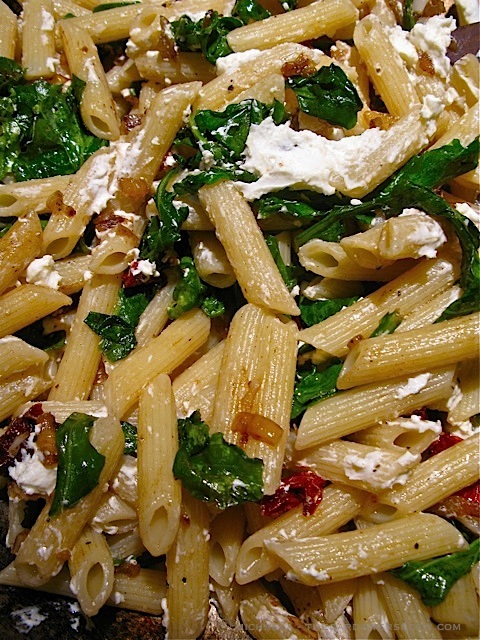 § 10 Responses to The Early Bird Catches the Arugula… And the Chard, Spinach & Lettuce too!" Oh Michaela! There you go again making my taste-buds quiver and my tummy do a twitchy sort of happy dance. Suddenly VERY hungry! 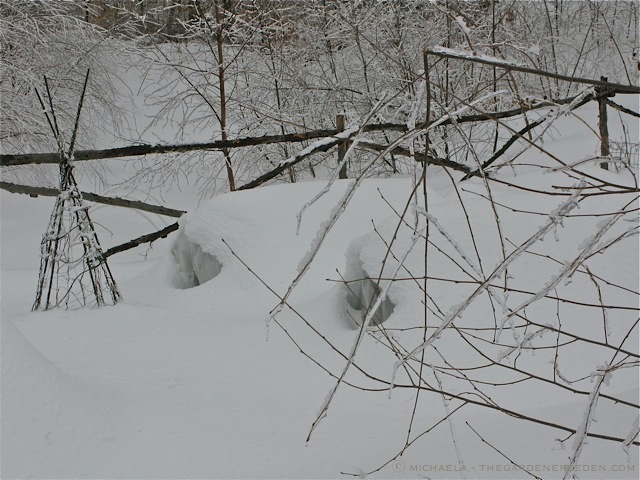 …Between the time spent doing all of that shovelling and working in the hoop-houses must do a pretty fine job of banishing the midwinter blues though, eh? 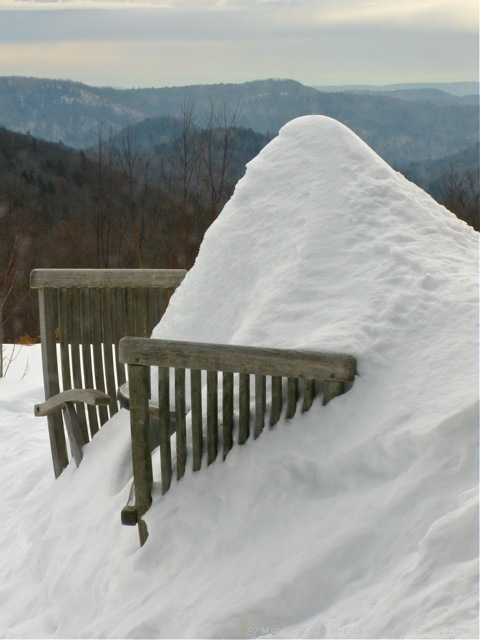 I almost hate to ask, but are you getting another go of winter weather this weekend too? Well, hello there, hungry one! Funny you should ask about the weather. 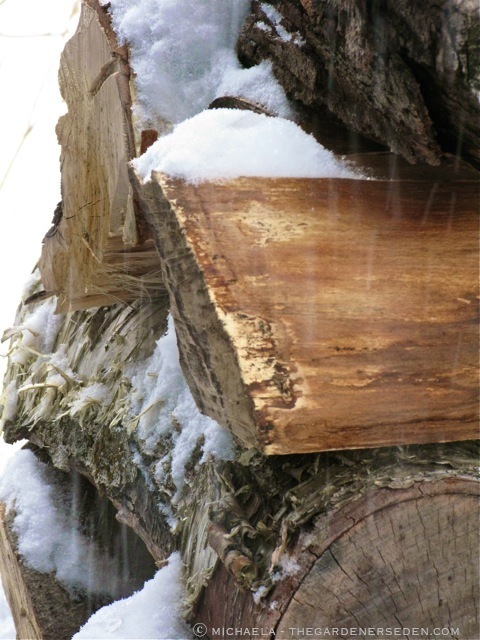 Suddenly, the temperatures have plummeted, the winds have risen —gusts of 50 mph plus— and snow is blowing in. False spring, indeed. But, we knew that. Back to winter, I guess. Thank goodness for the hoophouses! You always amaze me with all the wonderful things you do in the garden and kitchen! 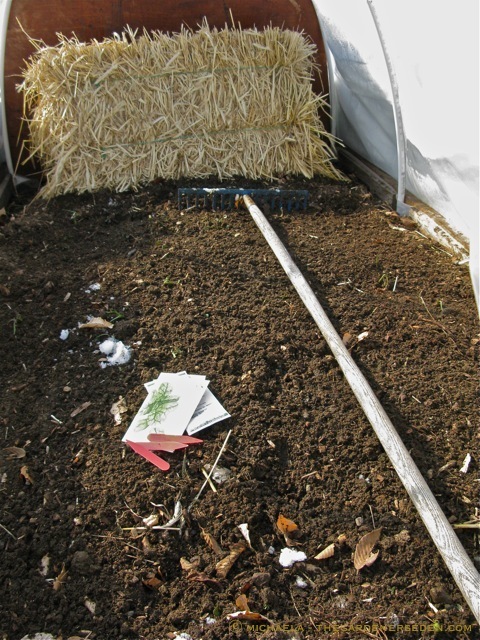 You inspired me to build hoop houses in my own garden last fall, and though more primitive than yours… they worked! I had lettuce til Christmas and I am still harvesting Bok Choy and cilantro (though they are almost gone). 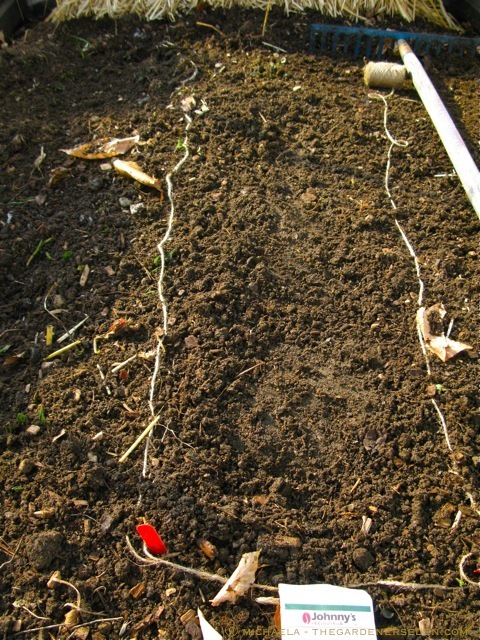 Yesterday I found some broccoli and spinach that somehow survived the winter and the warmer weather has revived them. THANKS! Question: I see a bale of straw in one of your pictures above. What is its purpose? My guess is that it is adding warmth as it decomposes. Or is it holding up your door? Well, I had Bok Choy, then I fenced around the garden to let the geese in to do some early weed and feed for me… they discovered that they could get under the plastic sheeting. When I went in this Monday to prep the beds and harvest what remained I found stumps!!! (Cilantro untouched LOL) Oh well, fair wages I suppose. A good garden shed is a wonderful addition! Thanks for sharing. 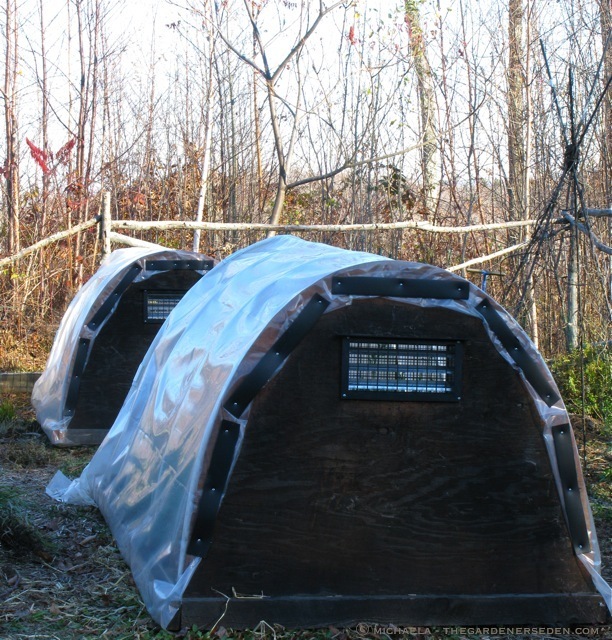 Wondering if you have problems with deer, squirrels, or bear trying to get in the small unheated hoophouse, and if so, how you deter them. Thanks! Thanks, Michaela. Wire-lined sapling fence sounds very interesting. Have you posted any pictures of it? Yes, You can see one photo here although the wire isn’t so visible (by design!). 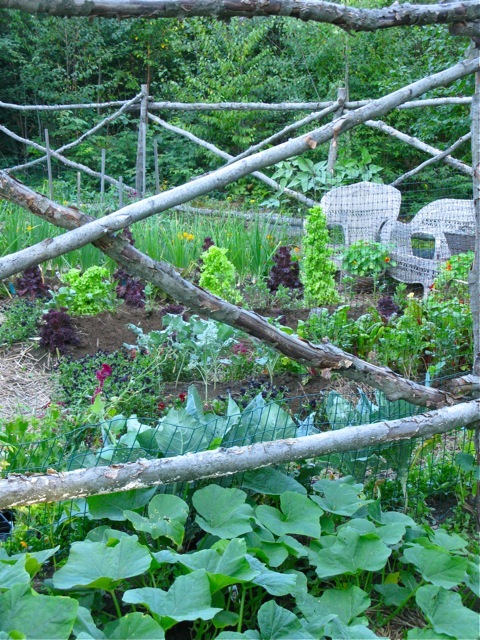 For more photos of the fence, click on the potager page here and scroll around. You can click on and enlarge many of the photos, though some are hyperlinked back to articles. A fencing article is long over-due here. Time to get back to article writing! I need Billy to come to my house! Thanks for the info & photos, Michaela. I notice the hoop house is inside the fence. Good deal! 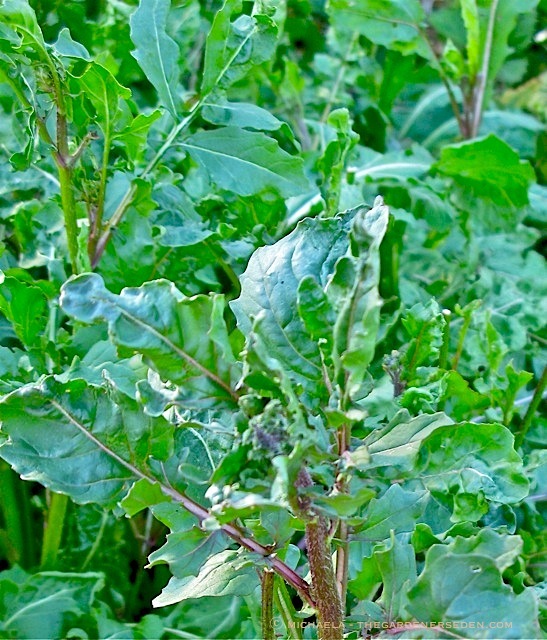 You are currently reading The Early Bird Catches the Arugula… And the Chard, Spinach & Lettuce too! at The Gardener's Eden.